On this thread I show a stacked image taken with a L Plan 20/0.4 infinity objective. The L Plan 20/0.4 has RMS thread (when I bought it I was thinking it was a Nikon L Plan CFI60 serie with M25 thread and 60mm parfocal) and 45 mm parfocal with a WD of about 10mm. Few weeks ago I bought a old Vivitar 200mm M42 lens (inexpensive on eBay) with the idea of use it as a tube lens for a Nikon Plan 10/0.25 infinity objective that I have. I decided to use the Vivitar as tube lens of the L Plan 20/0.4, you can see the result on the thread that I mentioned above. To use the camera + Vivitar lens on my Nikon Labophot I removed the trinocular head I mounted the camera + Vivitar lens on the Labophot stand. 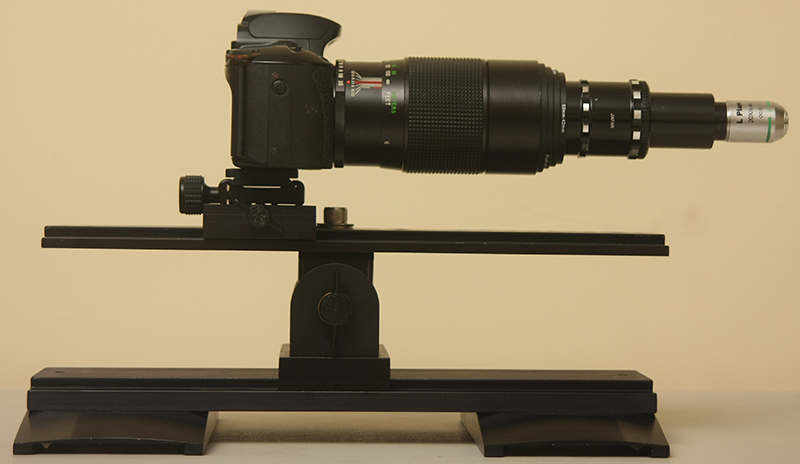 Myself, I would want a bit more support under the lens on the horizontal setup. Rogelio, I think you have opened up a whole new vista for people doing this. There seem to be lots of infinity lenses out there. If I am forgetting anyone who did this earlier, please correct me. I do not recall anyone showing pictures before. Charles Krebs has mentioned trying this, with mixed results. I will be interested to see how this concept develops. Previously we have had extensive discussion of which finite objectives work well for direct projection, no other optics. For infinity objectives, there is the additional complexity of which long lens, and possibly at what spacing. With good luck, most combinations will turn out to work well. For infinity objectives, there is the additional complexity of which long lens, and possibly at what spacing. With good luck, most combinations will turn out to work well. When other people try this, I would like to see reports of failures as well as successes. If some combination vignettes, or gives color fringes, or gets soft on the edges, please show us that! Otherwise I am afraid we may run into the "media bias" problem that I talked about with lens combos, where all the reported combinations work great but most of the possible combinations probably do not. I haven't found any data on L Plan Nikon objectives. Anyone? It would also be interesting to see if anyone has a Mitutoyo infinite lying about, to try, such as their 20x objective with 30.5mm WD. Having an old-fashioned sensor I could use a longer tube lens, so I've ordered the plumbing to try a couple of infinites I have on a 400mm. If they fill the frame, I think I'll be astonished. For the newer Nikons of this type you need to check into their "industrial" microscopes. They tend to separate them from the "biologicals". My mixed results were when an infinity objective was used directly with no tube lens. Thanks for the clarification. I thought I remembered some issues with vignetting and coverage also, but I have not tried to relocate the postings and memory is always doubtful. So I'm a little curious in regards to the 200mm lens. I have a Nikon telephoto 200mm but since the Nikon scope accomplishes this with a much physically smaller lens I started looking. One place, surplusshed.com, has like 3 or 4. Would one of them work? Under $20. Lots of cool stuff there btw. First try with your Nikon 200mm telephoto, use a set of step-down rings until you get 42mm (for this I bought a 52mm to M42 step down ring), after that you can use M42 extension and a RMS to M42 adapter (if you have the RMS to T2 adapter then get a T2 to M42 adapter). 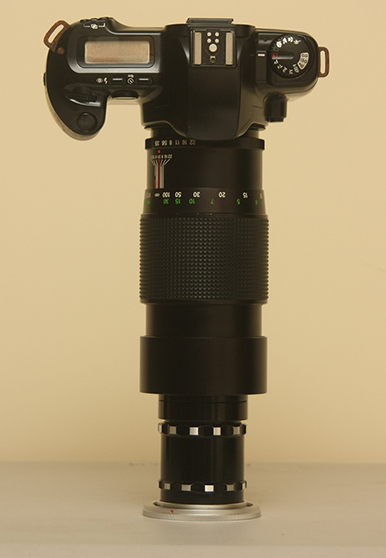 To mount the Nikon CFI60 series objectives you would need a M25 to RMS adapter. Hello, a very nice work Rogelio, I'm trying too some infinity corrected objectives mounted in front of a nikkor 200/4 AI, namely the Nikon CF Plan EPI oo/o as I could find on the web are mounted in industrial microscopes mid-90s. They appear to be a first generation Nikon infinity corrected optics, as they have RMS screw and a parfocal distance of 45mm, new objectives have different specifications. Unfortunately the information of the standard tube lens is not available ... and i´m not sure if the actual tube lens available in Edmundoptics is the same design as those of the 90´s Optiphot system. This is an interesting area to me, and Rogelio and I have corresponded a bit on it. Kudos to Rogelio for carrying out the experiments. I'm not an optics guru like some other members of this forum, but in my ignorant mind, it seems to me that any "infininite" objective simply sends the light beams toward the eyepiece in a "collimated"--or "parallel" form. 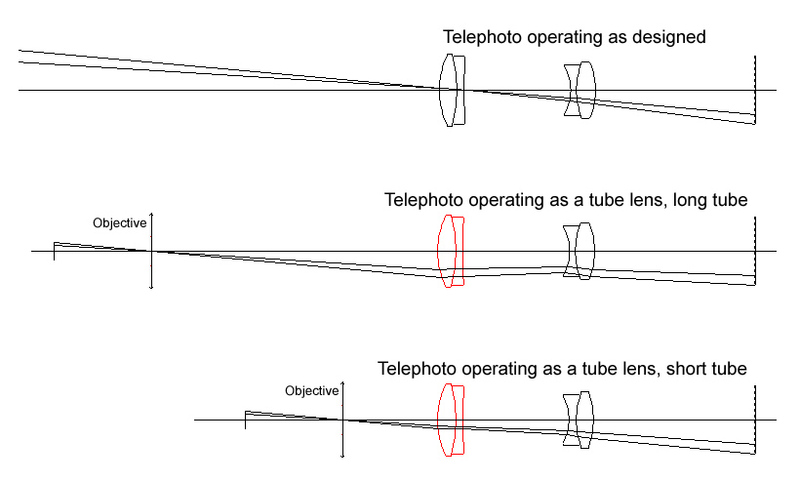 Any lens that decollimates--or bends parallel light beams such that they meet at a given point--should work as a tube lens and make infinitey-corrected objectives perfectly usable, so long as chromatic abberation is controlled elsewhere. And decollimating light is pretty much what standard camera lenses do. Of course, I'm just an ignorant macro photog, but so it seems to me--until one of you math/optics gurus sets me straight. And I already have a bunch of finite CF objectives, so the point is somewhat moot to me. But what Rogelio is doing makes sense to me, and could be a good answer for a lot of people. Am waiting to hear those with much more knowledge than mine weigh in. Go ahead--I don't mind looking like a fool--it's my natural state. Chris, this should illustrate the issue. You can see that the telephoto used as a tube lens is forming peripheral parts of the image using portions of the lens that would normally be used only at very wide apertures. The effect gets worse with greater separation between the objective and the telephoto. With too much separation, you'll get obvious vignetting. Less than that, and it's just that you won't be using the best parts of the glass. This is not a catastrophic problem, just some degradation of the edges. The effect shown here can be reduced by using a shorter tube. Offhand I can't think what bad effect a shorter tube could have, but sometimes my imagination fails me.